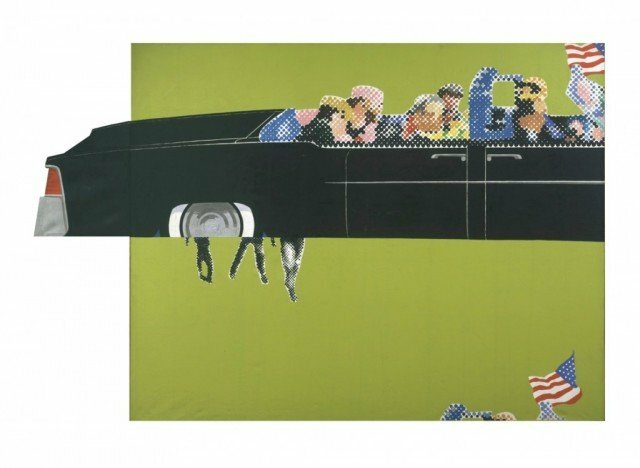 Gerald Laing’s Lincoln Convertible, the only known contemporary painting of the assassination of President John F. Kennedy, has gone on display at Tate Britain. Gerald Laing, who spent a large part of his life in the Highlands, created the artwork shortly after JFK’s assassination 50 years ago. His New York dealer refused to exhibit it and it was put in storage. Gerald Laing, who was born in Newcastle-upon-Tyne, had been living on the Black Isle when he died in 2011. He spent much of the 1960s working in New York and was a close friend of artists Andy Warhol and Roy Lichtenstein. Lincoln Convertible was considered too controversial to be displayed so soon after JFK’s death in Dallas 1963. It was kept in storage for about 30 years before galleries felt comfortable enough to exhibit it. Almost 9.10ft long, Lincoln Convertible painting is based on film footage of the assassination taken by Dallas resident Abraham Zapruder. The painting – in which Gerald Laing used colored dots for the first and only time in his career – depicts the Lincoln car in which the president and his wife had been travelling. Jackie Kennedy can be seen in her pink pill-box hat, while her husband leans over having been shot. The American flag is seen going off the screen to the right and below are the legs of secret service men running across the grass towards the car. The bottom of the canvas shows in part an earlier frame of the film, where the head of JFK’s chauffeur and the American flag are visible. The painting is owned by the artist’s estate. Gerald Laing’s most famous works included images of actresses Brigitte Bardot and Anna Karina.